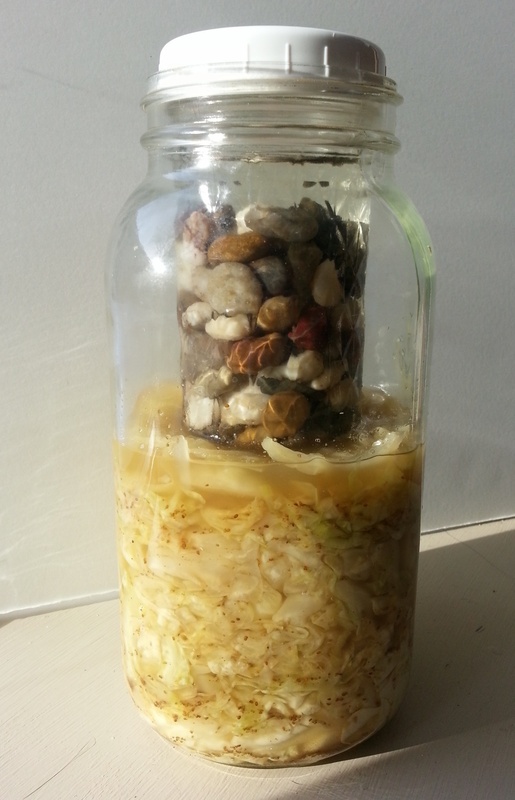 This post is a continuation from Part 1, where I outlined the first few hours of the sauerkraut-making process. 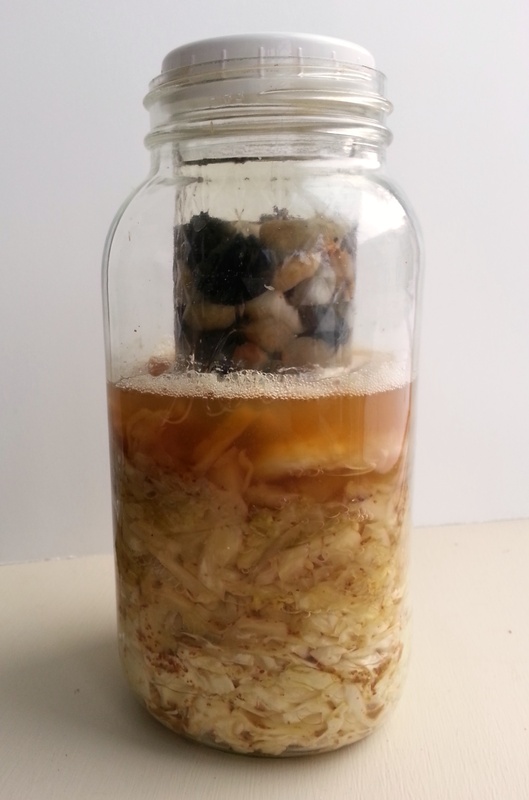 Here, I talk about the first week of fermentation. You can see in the photo above that some of the cabbage pieces are still exposed to air. It’s important to cover them with brine so that they don’t attract yeast spores, which can make your sauerkraut soft and slimy. So after taking this photo, I tamped down the kraut with a little more fervor and added a tiny bit of salt water to make sure that everything was covered. The brine has become darker, drawing color from the celery seeds I added last week. And the surface of the brine has become bubblier as the bacteria multiply, converting more of the naturally occurring sugars and starches in the cabbage to lactic acid and carbon dioxide. Be that were warmer in my house, there would probably also be a thin layer of white bloom at the surface. 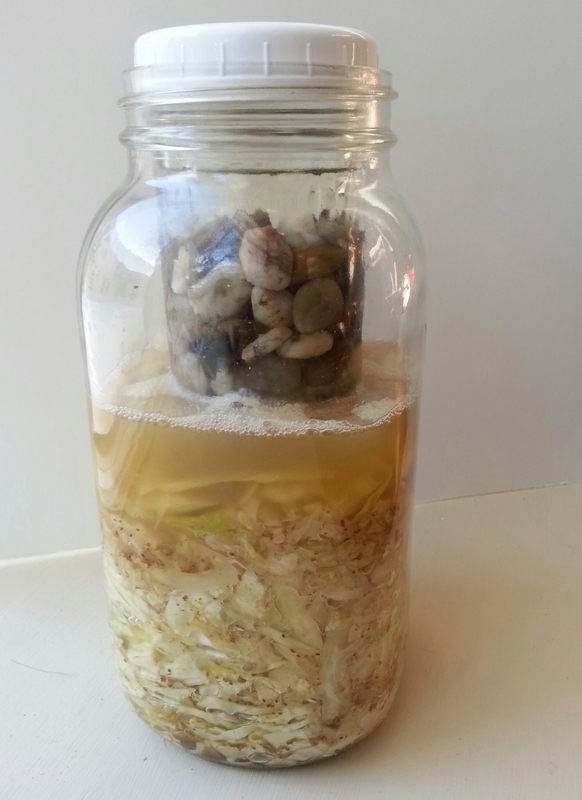 This bloom is made up of yeast cells and should be removed with a spoon every few days (or daily in hot weather). I keep the temperature of my house at around 60°F to 63°F in the winter, which makes for slow fermentation. I decided to taste the cabbage today even though I figured it probably wasn’t ready (I’m figuring on a 3-4 week fermentation time for this batch to get to the point I like), and it turned out I was right. In my experience, lightly fermented kraut has a slightly bitter taste that mellows as the more sour tones develop, and that was true for this batch. I also suspect that the celery seed may contribute to this, but who knows – this is the first time I’ve experimented with celery seed, usually preferring caraway. You can help the kraut get over the bitter stage faster by sliding in a wooden spoon or fork to release some of the gases. Don’t agitate the crowd too much, since you don’t want it introduce air in where it wasn’t before (remember those yeasts?). You can also speed up the lactic acid fermentation by adding some yogurt whey (the clear liquid that floats at the top of some cartons of plain yogurt, or the stuff you get when you strain plain yogurt to make Greek yogurt). I prefer not to do this, though, since it’s hard to predict the dietary practices of the people I’ll end up sharing the finished sauerkraut with. I wouldn’t want to mix in whey only to have vegan or kosher-keeping friends unable to eat it. If you’re just making the ferment for yourself and don’t know anyone who needs to keep dairy out of their veggies, though, feel free to experiment!